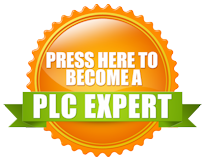 Learning PLC analog input and output is another great example of it being greater benefit to first learn PLC Analog before moving on to PAC Analog. In the PAC, instead of using SCL instructions in the ladder logic, you scale analog inputs and outputs in the analog card setup screen itself. (The I/O configuration area of PAC software like RSLogix 5000). Used in the video above is the Basic PLC Training Certificate Course download. You should take that course first before taking the (PAC Course) Controllogix RSLogix 5000 certificate course download. ^^^ Click to learn more.